The union of Sagittarius woman and Cancer man is very unstable, because they have completely different views on life and its manifestations. Points of contact between them, too, almost does not exist. Cancer is a reserved, often timid, but always passive man. However, under this mask are great ambitions and stubbornness. On the contrary, the Sagittarius woman is very active and free-loving. And in spite of everything they are crazily drawn to each other. It’s not for nothing that astrologers say that the love of Cancer and Sagittarius is a "fatal connection", that is, they both can not and can not disperse. The relationship of the Cancer man and Sagittarius woman is greatly influenced by the combination of accompanying Sun signs, which is why they are irresistibly drawn to each other, and the man Cancer, however trying to avoid it, will still fall under the charm of the Sagittarius woman. This woman always seems mysterious and unusually sexual to him, and he tries hard to keep her near him. The Sagittarius woman realizes that she was not dreaming about such a man, but the mysteriousness of Cancer, his ability to hide his feelings and emotions attracts her, and when she realizes that he is also able to fully provide all of her material needs, we can say that this The woman got into claws to Cancer forever. The only thing that embarrasses her is his caution and secrecy, she is not in a position to accurately determine his attitude to her, whether he loves her. At the same time, it is this secretiveness that attracts her, she even begins to like it, when he, thanks to his caution, restrains her carelessness. Despite mutual attraction, the alliance between Cancer and Sagittarius is impossible without the constant quarrels and scandals that occur most often precisely because of the peculiarity of Cancer always hide their emotions. The Sagittarius woman, although possessing great patience, finally does not stand his secrecy and begins to curse, to speak harsh, offensive words that can severely hurt such a sensitive person as Cancer. As a result, Cancer simply closes in itself and ceases to react to it at all. But in the end, to rule in this union will still be Cancer, because it is a Cardinal sign, and it is Mobile. On the physical plane this pair will be perfectly combined, for although it is a fire and passion, but its secret element of Water will show her that it is impossible to hurry with this man, he will lead her to where love is a miracle. Over time, Cancer will appreciate her honesty, sincerity, he will understand that this woman should not expect any dirty tricks. She will be grateful to him, that he with his self-control kept her from many mistakes that she could make due to her irrepressible nature. And although they are so different, but having learned to trust a friend, they will live a happy life. According to the compatibility of Sagittarius women and Cancer men, this couple has many difficulties and contradictions in their life together. But, if these two really love each other, they can not only live well, but together they can achieve success. The Sagittarian woman has an inexhaustible source of energy and vitality, which attracts the Cancer man both physically and spiritually. Often in this pair there is a contradiction and dissimilarity of views and opinions, beliefs and worldviews. But they are ideal friends and partners. Family life Sagittarius-Cancer couples will never be quiet, too different characters in these people. Because of the emotionality of Sagittarius women, both tend to experience in this union the whole range of complex feelings, from burning jealousy, tears and resentment to love and passion. Sagittarius is charming, but too frivolous. And her independence, she often hurt a sensitive man, Cancer. A man-Cancer leads an excessively "home" way of life, and thus causes discontent of the Sagittarius woman, who loves traveling and hiking. In an ideal pair, the Sagittarius woman and the Cancer man have mutual respect and related feelings. And already this, these two are enough for happiness. It can be safely said that not perfect pairs of female Sagittarius and man-Cancer do not exist at all. They disintegrate very quickly. If you look at them from the outside, the man-Cancer looks reserved and silent, and the Sagittarius woman is sociable and witty, though a little tactless. It is worth noting that the Sagittarius woman and the Cancer man are more likely to receive guests at home than to visit themselves. They like to show off their home, and there really is something to see! Most often, their house is rich, beautiful and tastefully furnished, and most importantly, the soul lives in it. Also, except at home, the pride of this family is children. According to the compatibility of Sagittarius and Cancer, this couple is very fond of children and responsibly approaches their upbringing. The Cancer man gives primacy to his wife in the house, and implements masculine qualities elsewhere. Despite the fact that the Sagittarius woman is temperamental and loves an active life, and the Cancer man belongs to the "home" men, they still find common ground with each other. If you look closely, the man-Cancer is not such a homebody, and the Sagittarius woman, with all the craving for travel, appreciates the traditions and needs a reliable house. And this man-Cancer can provide her with full. From the side it seems that it is difficult for the man-Cancer and the Sagittarius woman to agree on joint leisure activities. The Sagittarius woman is active and constantly in search of new impressions. Cancer, on the contrary, can completely relax and rest only at home with the closest people. But, in fact, this problem is quite easily solved. 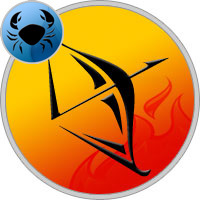 Man-Cancer and Sagittarius woman in this matter easily find a compromise. Difficulties in the compatibility of signs of the Zodiac Sagittarius and Cancer begin only when the feelings of a Cancer man are hurt. Despite the fact that it is a vulnerable and impressionable person, if it is angry, it is not a spectacle for the faint-hearted. On aggression, he does not step, and even surpasses Aries. And the Sagittarius woman, regardless of the fact that she belongs to the fire element, is timid and lost before the aggressive onslaught of one who greatly surpasses her in strength. Sagittarius is the sign of the mobile cross. These people tend to adapt to different situations, but they easily abandon their plans and change their plans in the event of obstacles. Therefore, in the conflict, the Sagittarius woman is easy to manipulate, as she reacts sharply to the insulting words of the Cancer man. And he, in turn, in the heat of feelings, too, does not know how to control the dialogue. As a result, instead of finding out the reason and making a decision on any issue, the couple has a useless and worsening relationship scandal. According to the horoscope compatibility of Sagittarius and Cancer — the main means of preserving harmonious relationships in their family is a sense of humor. The Sagittarius woman is good-natured and witty, therefore it will not be difficult for her to translate a quarrel into a joke. In addition, the man Cancer does not have a strong wit, and is very afraid of scandals, therefore, he will happily seize every opportunity to avoid quarrel and clarify the relationship. If you feel that the scandal is ripening, then urgently remember about your sense of humor. The main thing, remember, you can not make fun of the man-Cancer. He is very vulnerable and this only complicates the situation. Better laugh at yourself or over something neutral. If the quarrel has already begun, then, the man Cancer will not rest until he splashes out everything that is going on in his soul. In this case, it would be best to help the trick of our great-grandmothers — a fall into a faint. Then the wife’s anger evaporates, and he feels guilty for his cruelty. But, if you do not know how to faint at will, sincere tears will also suit you. If a man-Cancer understands that you are worried, upset because of what happened, then his anger will also dry up. Unfortunately, the Sagittarius woman is very straightforward and often brings the quarrel to the end, in which both lose. Here, "heavy artillery" can come to the rescue. Of course, this is the mother of the Cancer man.